Muddiwarx is our affix used to identify animals owned or bred by us - it is a KC registered kennel name, a TICA registered Cattery Name, an NFRS registered Rattery name and a UKAPH registered prefix. The humans behind the affix are Julie, Harry and Ben. I have been involved in training and showing dogs since I was 12 years old - which is a worryingly long time! Together we have competed in canicross races and sled dog events - often even against each other - nothing like a little bit of family rivalry! 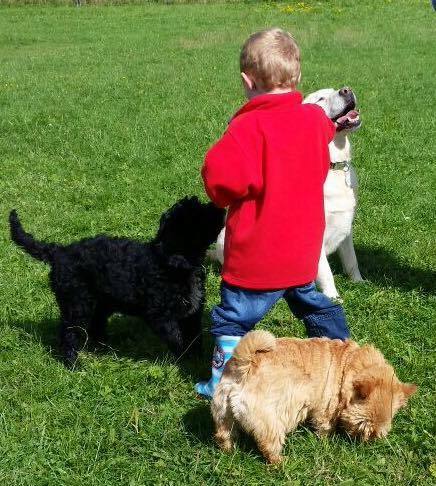 I am hoping that Ben will follow the family tradition and continue to be a big animal lover as he gets older! Already he enjoys being involved in day to day care and participates in dog training. At the moment I am concentrating on working towards some titles in rally obedience, dog parkour and training in Mantrailing, I also judge Alaskan Malamutes in the show ring from time to time. We are also very involved in animal rescue - I am rehoming co ordinator for the Barbet Club of GB and on the Rescue Committee for Alaskan Malamute Club of UK. I am also a member of The Animal Team network and carry out homechecks and dog assessments for a variety of rescues on their behalf. 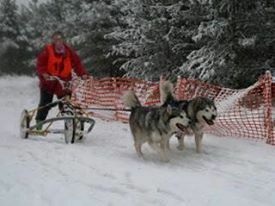 Competing in snowy Norfolk with Noobie and North - around 2006.